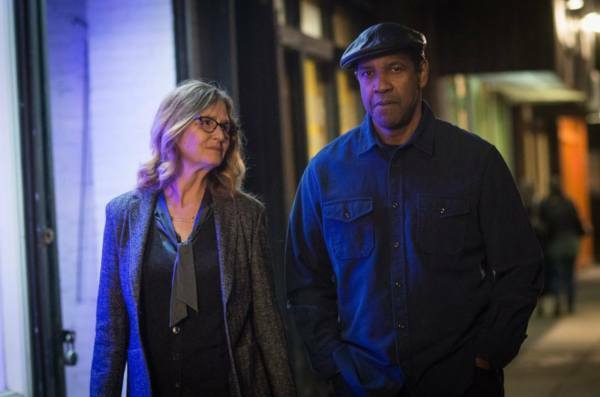 It is quite a considerable effort, having worked in Hollywood for four decades, for distinguished actor Denzel Washington to have never starred in a sequel, but that impressive track record comes to an end with The Equalizer 2, a follow-up to the 2014 box-office hit. What is utterly perplexing is what the two-time Oscar winner saw in this project to want to make it his debut franchise entry. Washington returns as Robert McCall, who has left the hardware store he was employed at in the original film, and now makes ends meet as a Lyft driver (complete with the expected montage of differing passengers). McCall however still helps those in need, as we see in the ludicrous opening minutes (which feels like the pre-credit sequence of a Bond movie), where in disguise, he takes on a group of kidnappers aboard a Turkey-bound train. I kept waiting for Liam Neeson’s Taken character to make an amusing cameo, but unfortunately that never happens. While McCall is doing his best to assist Jewish nursing home resident Sam Rubinstein (Orson Bean), and teenage gangster wannabe Miles (Ashton Sanders), old friend and former CIA colleague Susan Plummer (Melissa Leo) makes a surprise visit on his late wife’s birthday. The scene is supposed to indicate one of the few, trusting friendships McCall has left, but it merely comes across as a perfunctory construct for what is to follow. Plummer is soon forced to travel to Belgium, where one of the agency’s main contacts (and his wife) have supposedly committed suicide. On the scene too is her assigned partner Dave York (Pedro Pascal). Before Plummer can fully uncover that the deaths weren’t self-inflicted, and were in fact carried out by a couple of mysterious assassins, she is brutally murdered by unknown assailants. Husband Brian (Bill Pullman) is devastated, but once the news reaches McCall, a new mission of vengeance is set in motion, as he sets out to find out who was responsible for his friend’s bloody demise. The 2014 movie (a big screen remake of the enjoyable 1980’s TV series, starring Edward Woodward) was a slickly produced B-movie anchored by the screen presence of Washington. It offered nothing new in the revenge movie stakes, and took a long time to get where it was inevitably going (Walter Hill could have done a far better job, and much more efficiently too), never effectively using its lengthy screen time. The sequel amplifies all these flaws tenfold, making for a tiresome, predictable, derivative bore. Richard Wenk, who penned the first film, drowns the simple story in clichés and unnecessary subplots (Bean and his WWII ordeal seems to have come from another film altogether), and somehow manages to make the main plot appear convoluted, not through smart, intricate storytelling, but via laughably clumsy writing. Some scenes make no logistical sense (McCall sermonising Miles nearby a room full of gangsters he has just saved the youngster from at gunpoint; an overly elaborate mural that’s completed miraculously overnight to the neighbouring tenants’ surprise, even though it’s right where everyone walks by each day, to name a few), while other elements, while well-intentioned, come across as dated or poorly developed. The culturally diverse population that surround McCall, and his determination to steer Miles clear from gang life (you expect Sidney Poitier to appear at some stage) is offensively superficial, only adding to the film’s long list of failings. The villain is easy to pick, simply because a large portion of the film goes by without a main bad guy being introduced (all we get is a succession of inept henchmen). Wenk might think he’s being clever, but all he does is incompetently push the movie-goer towards the only possible suspect. McCall’s gift of foreseeing his opponents’ moves is taken to ridiculous extremes this time, with a crime re-creation scene that has one thinking they are revisiting Washington’s character from Tony Scott’s Deja Vu. Antoine Fuqua, a music video director who made his feature film debut in 1998 with the moderately entertaining The Replacement Killers (headlined by another powerful presence, Chow Yun-Fat), hasn’t really managed to hit a complete bullseye over the subsequent twenty years (Training Day was involving until a woefully misjudged finale; Brooklyn’s Finest is a solid drama in the mould of Internal Affairs and Q&A), despite continually being given the resources, both in-front-of and behind the camera. Fuqua frequently mistakes length for substance, but when skilful writing just isn’t there, the result is merely empty and padded. Another long-standing issue for Fuqua is how his directorial spark noticeably spikes when people are inflicting violent bodily harm on each other, and this trait is definitely on display here as it similarly was in its predecessor. Washington is the whole show here, but despite his obvious professionalism, cannot make the sub-standard material seem remotely credible or interesting. Fuqua is blessed in having a regular collaborator of the calibre of Washington, and it is his sheer presence that got me over the finish line. Leo is wasted as Plummer, who is used as a plot point rather than an actual person. It must be noted that this is the second film she’s done with Fuqua where she has been horrifically beaten (the other was Olympus Has Fallen), and this very fact makes the attack scene on Plummer feel particularly unsettling. Pullman, as in the original, is sorely underused, and the brief scenes he has all look like they were shot after he has just awoken from an afternoon nap. Yeah. That is what I thought. It was predictable, formulaic, unimaginative, and not believable.